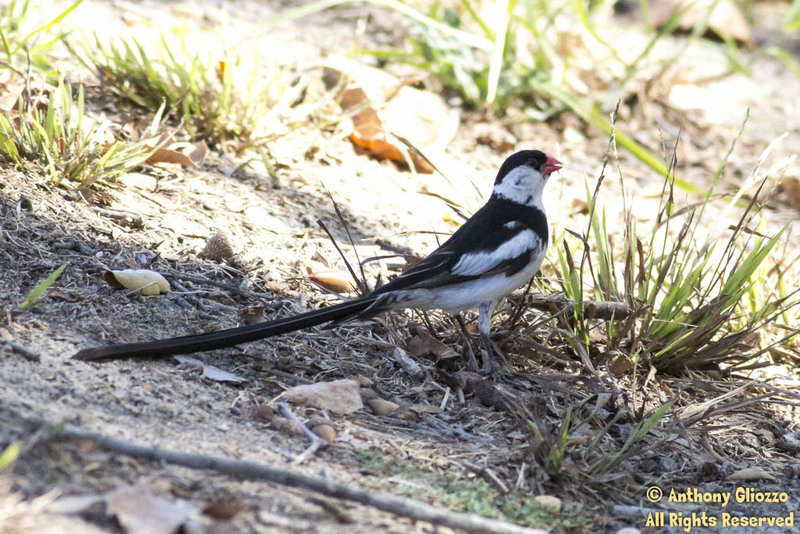 A male Pin-tailed Whydah in search of seed / food on the Barano Trail. Photo taken on September 21, 2014 around 10:50 a.m.
At around 10 a.m., after being on this local trail for about an hour, my peripheral vision was able to briefly catch a very narrow and lengthy tailed species in flight. I had hoped for its return as from experience I knew this was either a Scissor-tailed Flycatcher or a male Pin-tailed Whydah. The Scissor-tailed would be an uncommon, non exotic and a domestic find while the Whydah would be a bit more common and an exotic (caged release and originally from Africa – it did not fly here – i.e. migrate). However, either would be fascinating to watch after this brief encounter. A 20 minute wait proved beneficial (not exceptional as with a Scissor-tailed Flycatcher) as the earlier sighting was in fact the male Pin-tailed Whydah. The flying pattern of this male Whydah was rather cumbersome and clunky to say the least. It was neither swift nor agile. As it landed atop of a sycamore tree waiting for insects, a unique dodging pattern occurred moments later as it was thrust itself back and forth against a barren branch plucking insects (see in flight photograph below) one by one. I tracked the bird for about an hour and overtime the male eventually came within close proximity. He landed on the asphalt trail as I stood nearby in the shadows firing off a series of photographs with the 5D Mark III in Silent shutter mode and the Canon 400mm L 5.6 with a 1.4 extender. 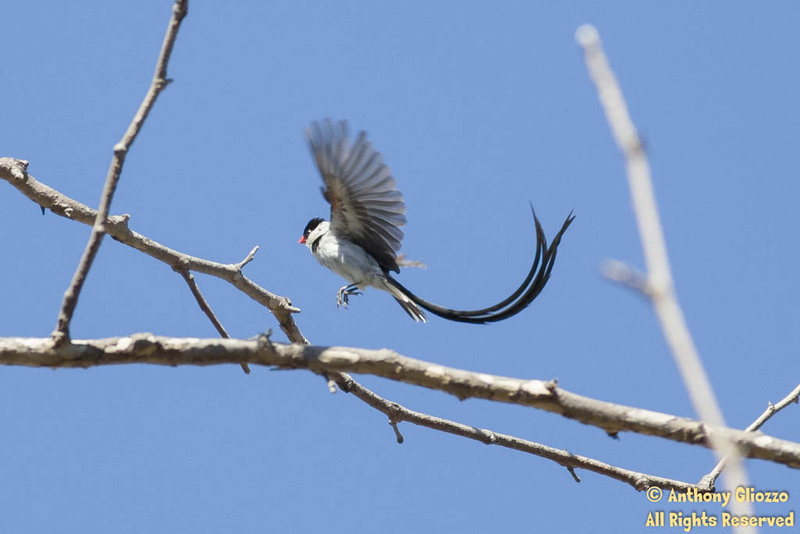 I have been on this trail numerous times weekly over the past 3 years and this is the first Pin-tailed Whydah. It’s presence apparently agitated a nearby Black Phoebe that I witnessed flying back and forth under a nearby rooftop. Three Northern Mockingbirds and several Western-scrub Jays also appeared to be bothered by its appearance. 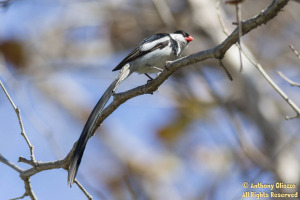 I have had some pin tailed whydahs in my back yard for several months now. I’ve had a male, female, and 3 juveniles. The male is there frequently throughout the day, and comes to eat the seed I put out on the patio. He is also very aggressive to the other birds feeding there, and will fly toward them to scare them off, usually with success. And, yes, he does seem to be struggling to fly up into the trees, where he appears to be “standing guard” over his territory, as he will swoop down to the poor birds that enter his domain! Today, 6-29-16, in Costa Mesa 92627, between 5-6pm, on the lawn in my backyard under a bird feeder, I saw a male Pin-tailed Whydah eating seeds for about ten minutes. On June 1, 2016 I saw a male Pin-tailed Whydah eating seed under my bird feeder in Ocean Beach (San Diego) 92107. He was here for about 15 minutes between 6-6:30pm. Several finches, sparrows, and doves were also feeding. He was very quick and nervous but intent on feeding. My wife and I saw a male Pin tailed Whydah in Sycamore Park off of Stone Hill road at San Juan Creek, at 6:00 PM on July 16. We have never seen the bird before, and we were amazed to see it. Spent about 15 minutes photographing and observing the small long tailed, bird as he foraged, and perched about signing with distinctive song. I’ve been watching this long tailed bird for the past week. Finally had the chance to get up close today, so excited to identify a male Pin tailed Whydah here in Tustin! thanks for the heads up..been getting many inquiries on this species. I have had a Pin Tailed Whydah in my backyard for days now. They chase off the goldfinches and doves to get to the seeds on the ground. He seems to rarely eat on the ground. We have had a Pin-tailed Whydah visit our bird feeder every day for the past couple of months. He has maintained his long tail feathers the whole time and we have witnessed his courtship dance several times, recorded it on cellphone video once. He is very aggressive towards other birds, especially doves. So excited to have found your site! My husband and I were having dinner on the back lawn with two friends at Arroyo Golf Club at the end of Avery Parkway, in Mission Viejo, last Thursday July 13, 2017. I heard a bird call I hadn’t heard before which caught my attention I looked up and saw what I thought was a Scissor Tailed Fly Catcher (based on the tail). I interrupted the conversation and pointed to the bird so I would have witnesses. I looked on the rare bird and didn’t see any posts. I couldn’t definitively say it was a STFC as I could see the color of the bird (back lit by the sun). But to me the body mass looked smaller than a STFC. 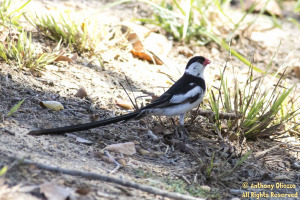 Now having found this post, I believe it was the Pin Tailed Whydah. Saw male at my hummingbird feeder today for the first time. In Dana Point. Female appeared to be with him, but didn’t get a good enough look at her to ID her for sure. I spotted a pin-tailed whydah at Mile Square Park in Fountain Valley CA last week. I walk there at lunch time and I saw it two days in a row. At first I thought it was a flycatcher but the red beak told me that it wasn’t. After I did a little internet research I came across this article. Today I was finally able to see the male whydah dancing in front of a female. He’s been here in Mission Viejo a long time and loves to sing. Today, 8-20-17, in Irvine CA 92606, I have a male Pin-tailed Whydah that has been coming to my small back yard all this summer, there are lots wild finches outside that I provide food for them every day morning and afternoo. I thik he likes it here he comes to eat morning and afternoon. Sighted here in Westminster in my backyard. Male, sitting on a wire with several finches. He them tried scaring them away. Then after 10 min the other birds flew away and he followed them. This was on 10-12-17. About 5pm.